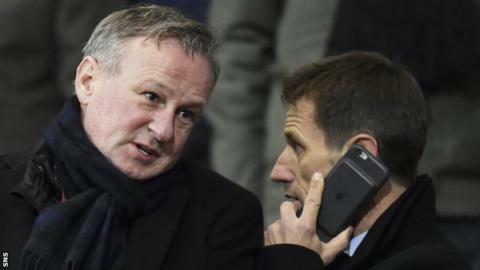 Northern Ireland manager and Scotland target Michael O'Neill says he has had "no discussions" with any other association. The Scottish FA made a formal approach to the Irish FA and were granted permission to speak to the 48-year-old. "Certainly the SFA have indicated they'd like to speak to me," O'Neill said. "But there's nothing more than that in terms of whether I have had discussions or I've not had discussions." Having led Northern Ireland to Euro 2016 and the World Cup play-offs, O'Neill has been the SFA's top target to replace Gordon Strachan, who left the Scotland manager's job in October. O'Neill was asked if discussions had taken place with any other national team and he told BBC Northern Ireland: "No, there's been no discussions, no." The SFA declined to comment when contacted by BBC Scotland.